Throughout the year in Goa, numerous festivals are celebrated by churches, chapels and temples. 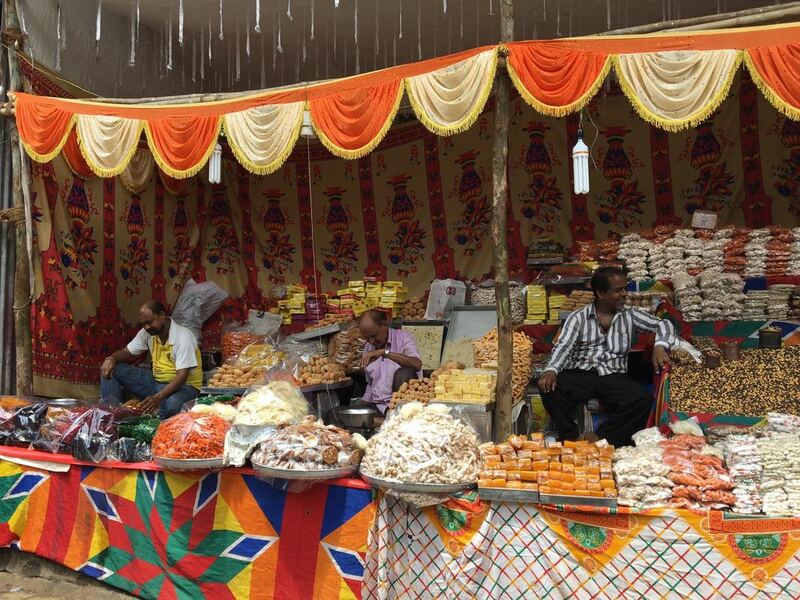 After the religious ceremony, devotees will walk through the fair browsing through the stalls set up in the vicinity. Vendors sell various items like toys, souvenirs, balloons, household furniture, clothes, spices, bangles, copperware, authentic foods, snacks, sweets, etc. One of the common and popular snack piled high like a mountain is the khaje. Also, referred to as the feast or zatra sweet. A visit to the fair is incomplete without taking home a pack or two of khaje and festache chonne (black grams). Khaje are finger-sized sticks encrusted with jaggery infused with ginger and a sprinkle of sesame seeds. Available in three different colours; golden covered with jaggery, orange with a layer of sweet coloured coat and white frosted with sugar. Living abroad and missing this tasty treat, I decided to give it a try. Simple to make, easy and so delicious, it brought back memories of Mount Mary's feast at Bandra in Mumbai and several other festivals in Goa. 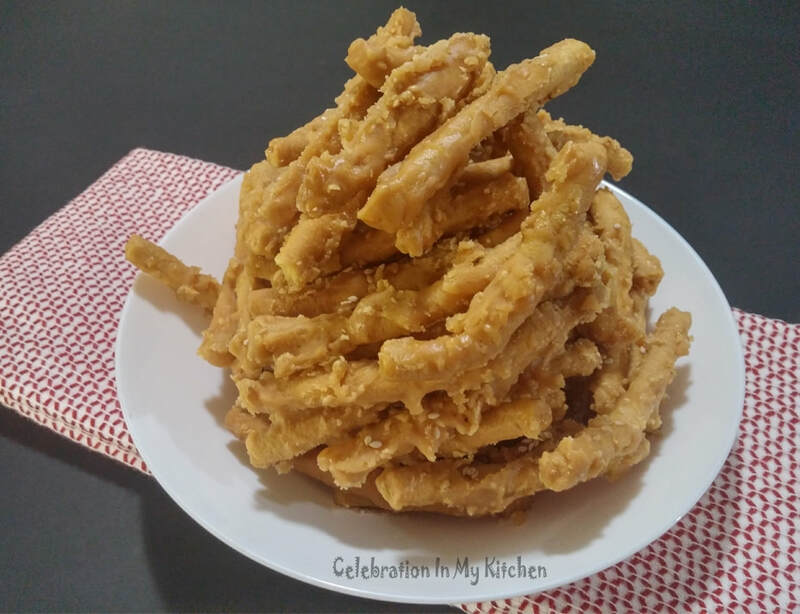 The finger-sized sticks are prepared with a dough of besan (chickpea flour) and other ingredients that are deep fried. Cooled, tossed in melted jaggery infused with ginger juice and a sprinkle of sesame seeds. When slightly warm, the sticks are carefully separated from one another. A perfect khaje has a soft jaggery coating flavoured with ginger and a hint of sesame seeds, crunchy with every bite on the inside. Eaten as a snack or dessert, this sweet is nostalgic and enjoyed by all. Jaggery is unrefined sugar made from sugarcane juice. Loaded with iron, calcium, phosphorus and potassium. Prevent anemia and regulates blood pressure. Rich in antioxidants and fibre, it helps cleanse and detoxify the system. The combination of jaggery and ginger helps to alleviate joint pain. However, jaggery is not advisable for diabetics. Sieve the chickpea flour in a bowl along with salt and baking soda. Incorporate the oil and rub with fingertips to get a crumbly texture. Mix in the water and form into a dough. 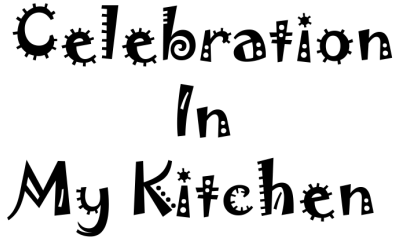 It will be sticky at first but as you keep kneading, the dough will be soft and pliable. Cover with a kitchen towel and allow dough to rest for 10 minutes. Divide the dough into two logs. Lightly grease the kitchen press and use a round hole disc. Place a log inside the cylinder and press dough into 12" straight lines on the parchment paper. 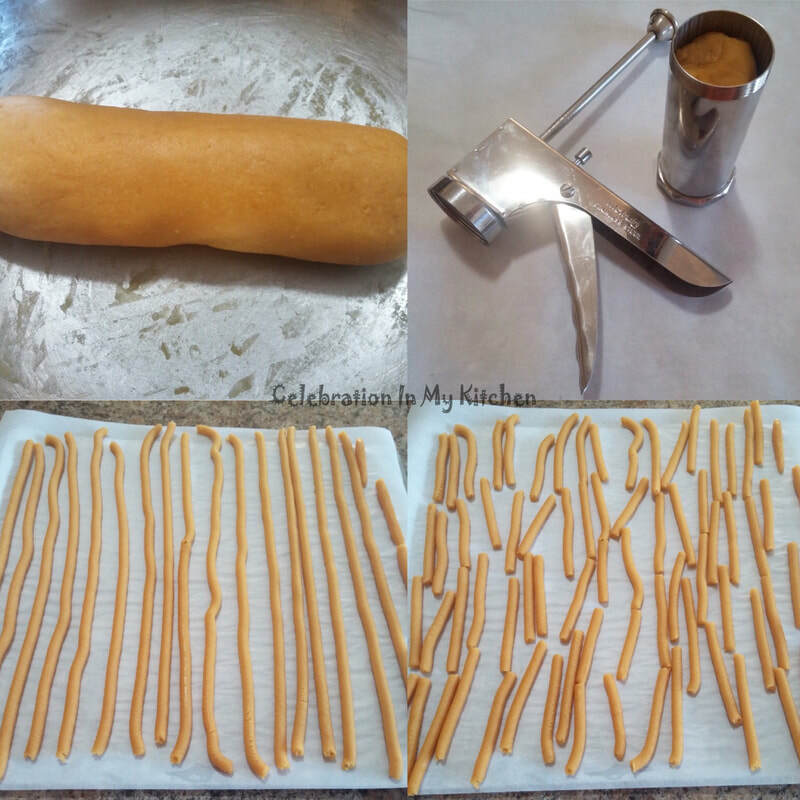 Once all the dough has been pressed, use a kitchen shear to cut each line into finger-size or 3-inches long sticks. Heat oil on medium-low flame for deep frying. When hot, slide the sticks from the baking tray into the hot oil. With a slotted spoon, gently try to separate if any sticks are stuck together. Fry until light golden brown. When cooked, the oil will have tiny bubbles and become steady. You will also get a lovely aroma of cooked chickpea flour. Remove and drain on absorbent paper towels. 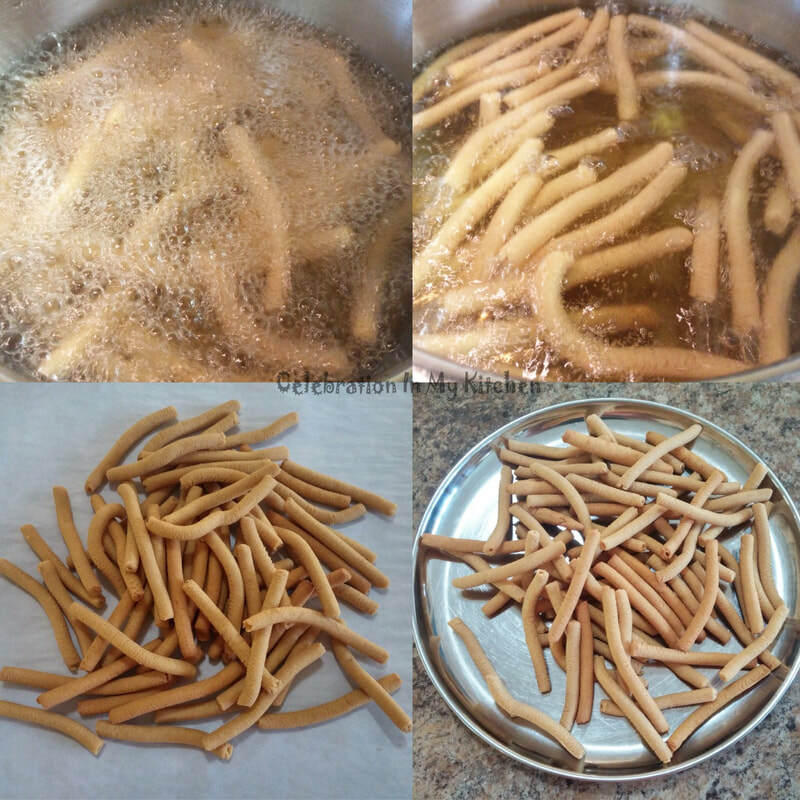 Sticks were deep fried in three batches and it took less than 10 minutes to fry them. Instead of following my above method, you can press the dough into 3-inches long sticks directly into the hot oil. Deep fry on medium-low flame and do not burn or brown them too much. If you do not have a press, make small balls of the dough and shape sticks by hand. To make ginger juice: Use a 2-inch plump piece of ginger, scrape or peel off the skin and grate using a flat hand grater. Squeeze grated ginger with fingertips to extract juice. Strain using a fine sieve to measure 1/4 cup of juice. In a deep wide-thick bottomed wok or pan, heat jaggery with water on a medium flame. Use a wooden spoon to stir and melt the jaggery. Once it dissolves, it will start to foam and bubble. Add the ginger juice, continue stirring until it thickens and reaches to a one thread consistency. It should be syrupy resembling honey. Carefully separate sticks while they are still slightly warm and place on a baking sheet lined with parchment paper. The khaje will harden and cool within 30 minutes. Store in an airtight container. Serve as a snack or dessert. If the jaggery mixture is heated for too long, it will crystallize with the khaje having a hard chewy coating (like brittle) instead of a soft one. 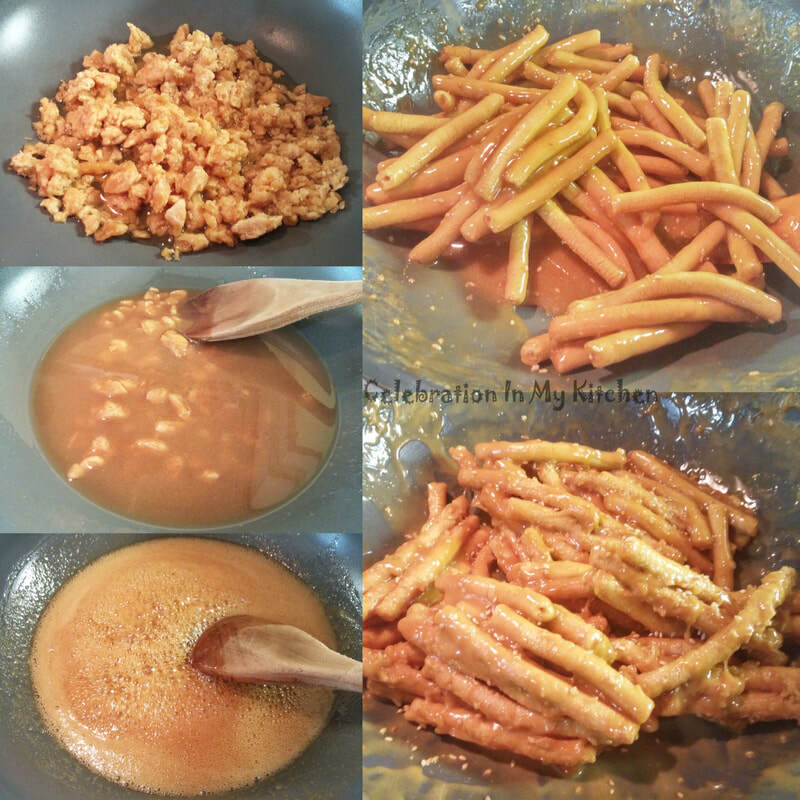 Addition of orange colour in the jaggery mixture changed it to brown. 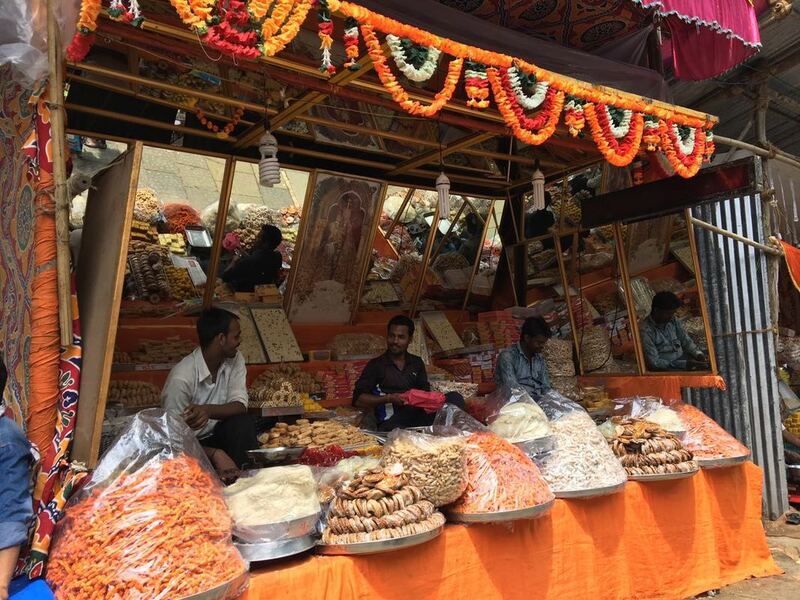 I feel vendors use a combination of less jaggery with more sugar and colour to obtain a bright orange colour. 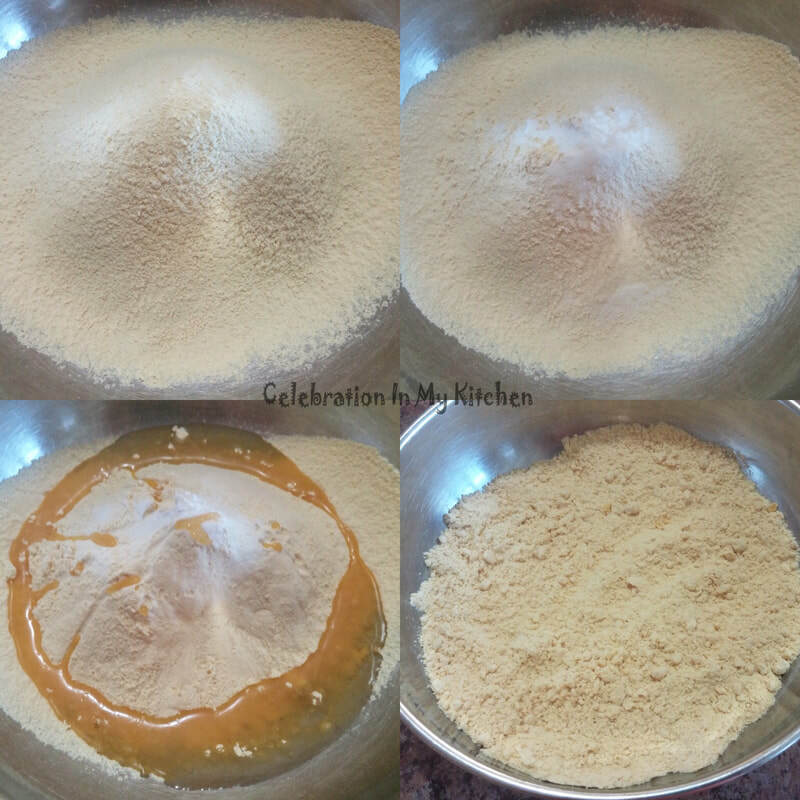 Make a simple sugar syrup with sugar and water for white frosted khaje.